This iteration of the RedMonk Programming Language Rankings is brought to you by Pivotal, the company behind Spring and Cloud Foundry. Join us in San Francisco for SpringOne Platform, a cloud-native event for the professional Java developer. Register here using the promo code S1P_RedMonk100 for $100 off your pass. With a new and stable process for collecting the base metrics, it’s time to publish our Q3 Programming Language Rankings. As always, these are a continuation of the work originally performed by Drew Conway and John Myles White late in 2010. While the means of collection has changed, the basic process remains the same: we extract language rankings from GitHub and Stack Overflow, and combine them for a ranking that attempts to reflect both code (GitHub) and discussion (Stack Overflow) traction. The idea is not to offer a statistically valid representation of current usage, but rather to correlate language discussion (Stack Overflow) and usage (GitHub) in an effort to extract insights into potential future adoption trends. With that, here is the third quarter plot for 2017. Besides the above plot, which can be difficult to parse even at full size, we offer the following numerical rankings. As will be observed, this run produced several ties which are reflected below (they are listed out here alphabetically rather than consolidated as ties because the latter approach led to misunderstandings). Note that this is actually a list of the Top 22 languages, not Top 20, because of said ties. Following the update to our process entering 2017, what we most wanted to see in a subsequent run was stability. Because programming language adoption is a lagging indicator typically assessed by counting metrics, wild fluctuations are likely to be false indicators and over-responsive to actual market shifts which tend to be slower. In this, we were rewarded, because this quarter’s rankings show the expected modest amounts of change. C++: Dating back to our first runs of these rankings in 2012, C++ has always been a top ten language and had actually risen from seven to its high of a tie for fifth. This quarter, however, it dropped to sixth. 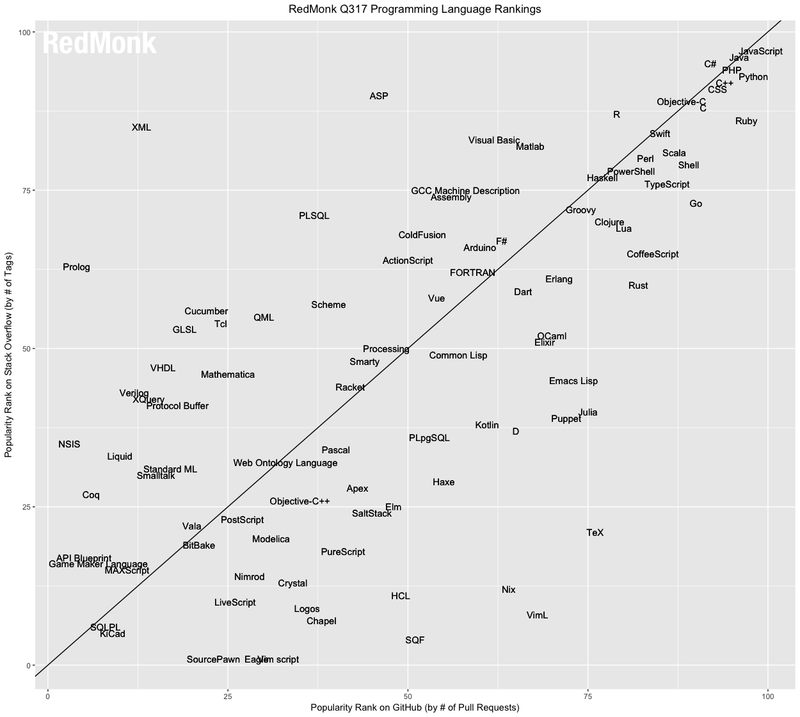 In the bigger picture sense, this is not particularly meaningful, as C++ remains a tremendously widely used and discussed language and solidly in the top tier. It will be interesting to watch its trajectory, however, to see if the focus on systems languages with modern features such as Go begins to erodes any of this traction or if the language’s raw speed will continue to sustain a high level ranking. Ruby: Of the Tier 1 languages, Ruby has demonstrated perhaps the most movement in our history of ranking languages. Debuting at #5, it peaked at #4 in Q313 and fell to #6, bounced back to #5 and has since been steadily drifting downwards. This quarter’s ranking of #8 is the lowest for Ruby to date, and it’s reflective of the posts that appear every so often on Hacker News, Quora or other sources asking whether or not the language is dead. The good news for advocates of the language is that these questions date back years; the fact that they’re still being asked in 2017 can’t be considered good, precisely, but the fact that it remains a question might be. That being said, it’s unclear where a Ruby bounceback, if there is to be one, would come from. Swift and now Kotlin are the obvious choices for native mobile development, Go, Rust and others are clearer modern choices for infrastructure. The web, meanwhile, where Ruby really made its mark with Rails is now an aggressively competitive and crowded field. We’ll see if Ruby has another trick up its sleeve, but in the meantime, it can take solace in the fact that it remains tremendously popular. Powershell/Rust/Typescript: None of the three biggest improvements from the last rankings iteration – Powershell, Rust or Typescript – could replicate those gains, as all remained static. Which is understandable; in each case, the languages are entering a level of the rankings were material improvement is harder and harder to come by. They need only look at Go, which prior to Swift was the fastest growing language the rankings had seen, but has since stalled in the bottom half of the Top 20 rankings. 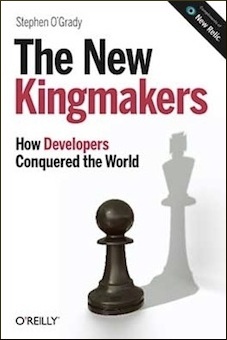 Still, it will be interesting to see, particularly on the part of the two Microsoft languages, whether their increasingly popular tooling (VS.code) and dramatically shifting organizational reputation can lead to even greater heights. Scala: At this point last year, Scala was down to #14 on these rankings from a high of #12 as recently as 2013. In January, it jumped three spots into a tie at #11. This run, it slipped back to #12 leaving Swift in sole position of #11. In spite of the theoretical indignity of being ranked behind a language years its junior, #12 is an impressive performance for a language, and that is nearly as highly ranked as Scala has ever been. But the question facing Scala advocates and observers is whether or not this quarter’s decline is merely another blip, or the shape of things to come. As a JVM based language, Scala is no stranger to competition – besides Java itself, Scala is regularly compared and measured against Clojure and Groovy not to mention, depending on context, everything from Python to Go. It may be facing its stiffest test yet in the language we’ll discuss next, however, which is inspired by Scala but has the advantage of now having a major front end driver for adoption to complement its back end relevance. Kotlin: Generally speaking, we don’t spend much time discussing languages ranked #46 on our board. When Google chooses one to be a fully supported language on the most popular mobile platform in the world, however, we make exceptions. Kotlin’s numbers in our rankings are interesting, if premature. We snapshot data as of the first of June, which means Kotlin had exactly fifteen days to profit from its new role as Google’s alternative to Swift. That produced a bump from its last quarterly ranking, if a small one: in January, Kotlin was at #50, so it jumped a mere four spots, which on the surface seems unimpressive. Two things are interesting about the Kotlin numbers, however. First, the jump it made to get to #50. Kotlin spent the 2016 calendar year way down at #65 on our rankings; all of a sudden in January, it jumped 15 spots to #50. If you look at the Stack Overflow chart from our look at the language, it’s clear that the “low key buzz” Steve Yegge referred to was real and measurable (and, as an aside, will likely have us looking more closely at anomalous results down the rankings more closely in future). If we date not from Android’s decision, then, but from the early unannounced interest in the language, we’re looking at a 19 point jump. 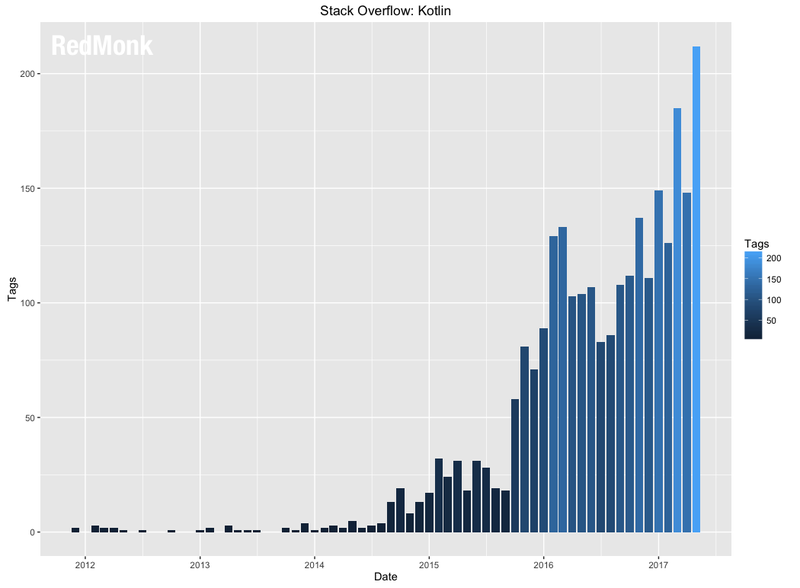 But just as interesting were the factors behind Kotlin’s #46 ranking: specifically, it was weighed down by Stack Overflow. Our GitHub rankings placed Kotlin 39th, but on Stack Overflow the language came in in 60th place. This is suggestive of people exploring and writing in Kotlin behind the scenes, but not discussing it much in public. It seems safe to assume that that ratio will change with Android developers worldwide increasingly looking at Kotlin for their applications moving forward. The big question facing Kotlin then isn’t whether it will experience gains based on interest – the language already has jumped nearly twenty spots in a year’s time which is very unusual – but how quickly, and to what degree. Are we looking at a Rust trajectory? A Go trajectory? Or, most exciting to advocates, one that looks like Swift? Kotlin’s already moving, but our January rankings should be fascinating to watch for Android’s new first tier language alone. Where is delphi? Pascal is not Delphi if your answer is pacal. CSS is not a language. It would be useful if this ranking included up, down or static motion in the text list, like the distro watch list for Linux distributions. It is hard to gauge what’s the meaning or implications are, just from the list and your short group of caveats. Your language rankings are always interesting. Thank you. It would be great if you could go a step deeper and rank languages against different domains. For example: If you were to write native mobile apps, then Swift or Kotlin may be really good choices to invest your time in. But, if you had an interest in distributed computing, data processing or cognitive computing, then learning Scala may be much more rewarding. Still, it’s a difficult thing to get right, and more of an art than a science. As always, well done. I find this ranking amusing since it reflects a trend towards adopting languages which are easy to use rather than the most powerful or flexible. Having written my 1st program in 1962, in machine code, on a 1st generation mainframe, I’ve some experience in the trade and have used most of the programming languages over my 55 years of programming. In my opinion C++ stands out as the best language, with Java and Csharp and other closely related languages which, in trying to overcome the complexities of C and C++, have reduced some flexibility. Unfortunately, the work of the associated committee has turned a remarkably straightforward language into something which is opaque and, I suspect will produce programmes which are difficult to maintain. Fortunately, one is not obliged to adopt all of the changes!! !